... but yeah, I've been busy. 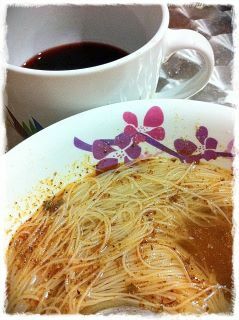 - One of my many late night dinners at home over the last few weeks: Tom yam instant mihun soup with a side of uncomplicated red wine (in a coffee mug).... Sophisticated? Nah. Comforting after a long day? YES. While I can't say that I haven't eaten out at all (there is a big backlog of posts building up), I haven't been quite energetic/ disciplined enough to blog properly. Take care and try to find a little time for yourself. I wish you happy holidays! Poor gal.. don't work too hard.. and happy holidays!! Gets to all of us. Hang in there! Seasons Greetings and here's to a bigger,better and greater 2012! Joy to you, love to you, everything good to you this season. Have a blessed Christmas J!